Epithe ovarian cancer has the highest mortality of all gynecologic cancers with an estimated 22,280 cases diagnosed in 2012 in the United States and 15,500 deaths . For women between the ages of 60 and 79 years of age, ovarian cancer is the fifth leading cause of cancer death following lung, breast, colorectal, and pancreatic cancer . Survival improvements for newly diagnosed ovarian cancer have reached a plateau using upfront surgery followed by platinum- and taxane-based chemotherapy. Thus, investigational efforts with new therapeutic agents are underway in an effort to overcome platinum- and chemotherapy-resistant cancer and ultimately improve survival. Insights into the molecular biology of ovarian cancer through mechanisms such as The Cancer Genome Atlas Project have identified potential therapeutic targets . 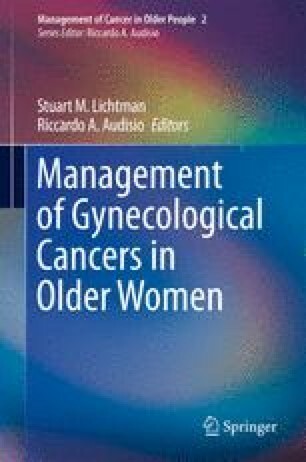 Efficacy, toxicities, and drug metabolism related to targeted therapies in the elderly patient with ovarian cancer are not available, and thus, data on the risk-benefit ratio of targeted therapies in this age group are mainly derived from studies in non-gynecologic cancers. This chapter reviews the available targeted therapies for the management of ovarian cancer and outlines the application of newer biologic agents in elderly patients with recurrent ovarian cancer. SEER. Surveillance, epidemiology and end results. http://seer.cancer.gov/statfacts/html/ovary.html. Accssed on Oct 15, 2012. Agency: EM. Avastin (bevacizumab) product page. http://www.ema.europa.eu/docs/en_GB/document_library/EPAR_-_Product_Information/human/000582/WC500029271.pdf Accessed on 15 Oct 2012. Avastin. [package insert]. South San Francisco: Genentech Inc; 2009.http://www.fda.gov.